Mostly Hong Kong, American, and British movie reviews. We could all use an Uncle Buck in our lives. Sure, he may be pushing 40 and still sorting out some things, like a steady job and relationship. Also, he probably needs to Marie Kondo his bachelor pad and cut down on the cigars, but Uncle Buck cares, a lot, and that’s worth something. He’s a natural with kids, talking to them rather than down to them, and he takes his responsibilities seriously. The man knows the importance of wearing a warm hat in the Chicago winter too, so there’s someone you can trust. Reliable is not what comes to mind when we first meet him, however. Bob and Cindy Russell (Garrett M. Brown and Elaine Bromka) need to fly out of town after learning that Cindy’s dad has suffered a heart attack. They reluctantly ask the only person they know who can come around on such short notice, and that’s Buck (John Candy), Bob’s younger brother. It’s not an ideal arrangement for anyone; Cindy cuts Buck’s pictures out of the family photo album, and Buck can’t even remember the names or ages of his nieces and nephew. The plan is most disastrous for oldest daughter Tia (Jean Louisa Kelly), a teenager who really doesn’t need adult supervision, thank you very much. She digs in her heels and prepares to battle it out with her uncle before he can destroy her perfect high school life by getting between her and her boyfriend, Bug (Jay Underwood). 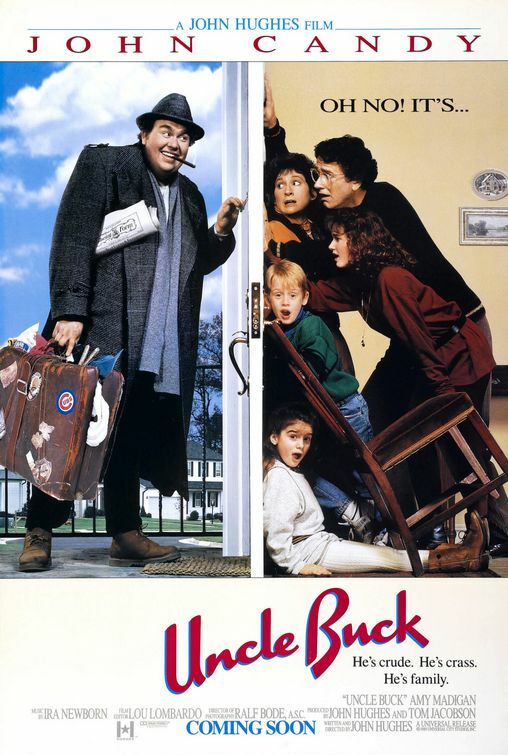 I expected the film to be a formulation of the man-child films that have been so popular these last two decades, but Uncle Buck isn’t that at all. Besides lazily vacuuming up some stray frosted flakes from his lap and microwaving the laundry when he can’t get the dryer to work, Buck is a solid adult figure. Not only does he make sure the kids get to school on time, but he even makes them fancy omelets with onions for breakfast. Sure, he waffles on a full-time job at his longtime girlfriend, Chanice’s (Amy Madigan), auto shop, and that affects their marriage plans, but the real heart of the story is his relationship with his nieces and nephews, who also include young Miles (Macaulay Culkin) and Maizy (Gaby Hoffman). Over the course of a few days, the kids come to appreciate their uncle’s openness and sense of fun, something that seems to be missing from the normally stressed out household. Even diabolical teenage Tia finds that an uncle’s stern guidance can really help a girl when she’s sorting out love and stuff. The film doesn’t deliver many belly laughs, but it is filled with small comic moments that will make you smile. An innocent, pre-Home Alone Culkin steals a few scenes, including one of my favorites where he interrogates Madigan’s character through the mail slot. Candy is the lively, good-natured center of this funny family comedy though, and watching him is a sad reminder of all the great roles he never got to play after his death in 1994. His presence fills the movie with warmth, and even when Uncle Buck acts harshly, like when he castigates a clown for showing up drunk at Miles’s birthday party, he does so with great love for his family. Posted in USA, Western movie reviews and tagged Amy Madigan, comedy, family films, Gaby Hoffman, John Candy, Laurie Metcalf, Macaulay Culkin on August 17, 2018 by limmer13. This blog began as a way to vent my frustrations about bad and sexist Hong Kong movies. Now apparently I just write about Hallmark movies.